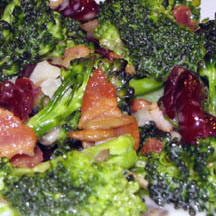 CooksRecipes has quality, kitchen-tested recipes for delicious salads featuring broccoli as a main ingredient. This broccoli salad is so tasty, it nearly steals the show from the entrée. 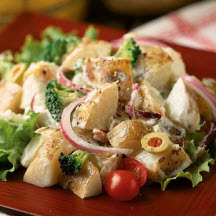 A colorful and hearty potato salad with broccoli, fennel, red onion and stuffed green olives tossed in ranch dressing. 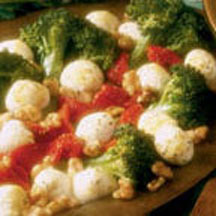 A festive salad of broccoli spears, roasted red peppers and fresh mozzarella balls, sprinkled with toasted walnuts and drizzled with a balsamic vinaigrette.